Where Did That Sign Go? Last week, my husband and I were running some errands across the bay. On the way to our first location, we saw a sign which said, "Bay Front Park." We had been to the Bay Front Park when it was first being built and we wondered if a kayak launch had been added since then. We determined to stop by and see on our way back. Following the same road back, we looked for the sign, but never saw it. We even turned around to look coming from the other direction. We never saw the sign again. Finally, we gave up and turned around to go back home. It was a few minutes later, and further down the road, we saw the sign and the road leading to the Bay Front Park. We visited the park, walked the boardwalk, and yes, there is a great place to launch our kayaks which is on the agenda for this week. The reason we couldn't find the sign when we were looking for it was that we were looking in the wrong place. We would have never found the sign on that part of the road because that wasn't where the sign was. Sometimes that's like the Lord's will in our lives. We call ourselves searching for His will, but we are looking in the wrong place. . .sometimes we are looking only where we want to find His will, not where He wants us to find it. When we gave up looking where we thought it should be, that is exactly when we found it. The bottom line is that His way is perfect and the Scriptures tell us, "The secret things belong unto the LORD our God," (Deut. 29:29). He will make His way plain before our face when we stop trying to direct Him as to where that path should be. We can trust Him for His knowledge, His way, His judgement and His love are all perfect. Like most Americans, I have played with my family tree. I have found interesting things. I have come up against the occasional brick wall. And I have found things I would have rather not uncovered, like four brothers far back on my grandfather's ancestry. They didn't like the way the new government had taken over their land, so they acted as spies for the British during the Revolutionary War. Apparently, the town didn't forgive them and didn't even let them be buried in the town cemetery. Hmmm. . . I'd rather just forget that part. I found a great-great-great grandfather who fought in the Civil War and died as a Prisoner of War at Elmira Civil War Prison Camp in New York in 1865. I found a grandfather who immigrated from Greece, one who immigrated from Ireland and a grandmother of Irish-Scott and Jewish heritage. There are many names in my family tree I don't recognize, but some of the names I know because they are repeated in the names of people I now know. My brother carries my both my grandfathers' names. I am named after my paternal grandmother. My sister is named after my maternal grandmother. Things just have a way of repeating. Even generations later, we found similar names repeating. Yet those who once bore those names have been long forgotten. At least to us. There is One however who does not forget. There is One who not only remembers us, but gives us a name which is known to no one else. People often have "pet" names for each other. My husband calls me "Sweetie pie" more than he ever calls me by name. The girls at work rarely call me Frances. They call me what all my family has called me as long as I can remember, "Frannie." Our youngest daughter started calling her older sister "Mo" years ago, and still does to this day. Our son affectionately calls -- and even sends mail to -- his little sister under the name "Big Potato-Head." I think we all love an affectionate name, something special between us and that person. A name reserved just for the two of us. How much greater when that name is between us and the Lord of Lords and King of Kings. Imagine what it will sound like to have that name -- known only between the two of us, and therefore spoken only between the two of us -- spoken by His lips? What rapture must fill our hearts at that sound! Many in our family tree may eventually forget us. . .friends we have known along the way may no longer remember or name or our face. But there is One waiting to give us that white stone and whisper our name so that only we can hear. The only sweeter than that will be our whispering of His name back to Him. . .
Oh, Jesus is the sweetest name I know. There is a verse I have always found interesting. The Apostle Paul said in 2Corinthians, “we were troubled on every side; without were fightings, within were fears.“ I don't think much about the Apostle Paul having fears within. But all of us at some time in our lives, are tempted to fear. Many may not know of our temptations to fear because we so often keep these fears bottled up inside of us. I don’t know about you, but I always felt if I said it aloud, it was more likely to happen! Sometimes we feel powerless to know how to deal with these fears and even seem overpowered by them. Now I am going to confess to you, there are things I am tempted to be afraid of. I am tempted to be afraid of the dark. I always, ALWAYS, have a flashlight with me. I also don’t want to be in constrained places. Just thinking of them gives me the temptation to be afraid. When I give in to these fears, and their myriads of brothers and sisters, when I allow them to rule my life, to overtake my thought, to let the “what ifs” reign in my heart, there are things I can be sure of. I can be sure I won’t know the rest the Lord Jesus has promised us, and I won’t be living in a way that glorifies the Lord Jesus as I would if I trusted Him and rested in Him. Mostly, if I let the fear reign in my life, I am in essence saying that the Lord Jesus isn’t big enough for that particular situation in my life. He can’t supply there, or He can’t sustain me there. Since the time I was sixteen, one of those “what ifs” was losing my Daddy. My Daddy was my core, that person I went to for strength. I was tempted to fear his death for 24 years. He was my Peace, the Scriptures say “He is our peace.” In Him I found Rest, and through my tears, He was my Joy. Sometimes the “what if” is “what if I something happens to my child? Or what if I lose a child?” If you are a mother, you know that fear. I have had temptations to that fear with all of my children. I still do. With a son deployed with the United States Marine Corps, those temptations are quick to come. On October 5, 1988, we experienced the pain of looking at an ultrasound screen and being told the baby we were expecting was not going to be. The Lord was trustworthy in that situation, too. He was everything we needed. He was our Hope. He was our Peace. In the midst of bitter tears, He was our rest. There are fears and temptations that whisper at me still today, almost every day. Only sometimes they don’t whisper, they shout and scream. But I have something I can scream back, and you can scream back at yours, too. I can scream back that the Lord Jesus Christ is trustworthy. No matter how great the storm, our Resting Place is secure. We rest in the Solid Rock of the Lord Jesus Christ and He has been, is and will forever be all we need. He is greater than any situation that may come into our lives. He will always be trustworthy, He will be exactly what we will need Him to be in every situation and He will keep our hearts in peace. There is nothing or no one who can or will fulfill the needs of our hearts but Him. Not spouse or child or job or house or even ministry. If we are looking out to the future for something to fulfill us, we are looking in the wrong place. The Lord Jesus alone can fulfill our hearts. When believe this, we will know peace, because if we have accepted the Lord Jesus as our Savior, we can never Lose the One thing we need to fulfill our hearts, because we can never lose Him. When our oldest daughter was in college, she studied Italian and wrote a life motto in Italian, "Avede le fede in Deo sempre bene vivremo", or "Have faith in God always and we shall live well." “La confiance dans le Seigneur toujours et lui ayant nous avons tous.” Or "Trust in the Lord always for having Him we have all." Having Him we have all. We can always trust Him knowing we shall live well. We have a Solid Rock to cling to no matter how fierce the storm. We have One who gives a Song no matter how dark the night. We have a Fountain springing no matter how dry the desert. Having Him we have all. And in Him, we rest. You may have noticed, we have a new name and also a new address. The address for "The Powder Room" has in the past been http://thecafepowderroom.blogspot.com. That's a little long and cumbersome. Also, when searching for "The Powder Room" there are sites that focus on everything from gun supplies to bathrooms to cosmetics. Our site is in the mix, but not so easy to find. All of this prompted a change both in name and address. Our new name, which is just a variation of our old address, is now Cafe Powder Room, which denotes that we are an adjunct to The Orange Moon Cafe. The address, www.cafepowderroom.com, should be much easier to use. Please feel free to share both our name and address. I can't count how many times I have heard the sentence, "You look so much like your mother!" I'll admit, it isn't one which has ever seemed to bring me any great pleasure. I guess most young women growing up have many looks they try to avoid and looking like "Mom" would probably be on the top of that list. I always thought when I was younger I looked like my Daddy. My dark eyes and dark hair matched his. My mother's eyes were green and her hair, well over time her hair had been every color except dark. Naturally it was a darker blonde, but there are pictures of her with red hair, very blonde hair and then in the later years of her life beautiful, sparkly snow white hair. I once turned the page in our family photo album and briefly wondered about the picture of myself I found there, until I realized it was a picture of my mother from many years ago. Regardless of hair color, I can not escape the fact that I walk and talk and move like my mother. Her genes are indelibly stamped upon my own. In the last year or so, even my own dark locks have gradually turned lighter (with a little help) and now I am about the same color blonde my mother was at the age I am now. I am becoming more to look like my mother. I seemed to be changing more and more into her likeness. The Scriptures tell us we are "conformed to the image of His Son." We are changed into the same image as the Lord Jesus. That is the purpose of all our trials, all our difficult and trying places, to remove all that does not conform to His image. So the next time we find ourselves in a place of hardship, a place of apparent loneliness, a place of tears, let us remember the incredible work the Holy Spirit is performing in and through us in that place. . .the work of changing us "into the same image from glory to glory, even as by the Spirit of the Lord." The Best is Yet to Be. 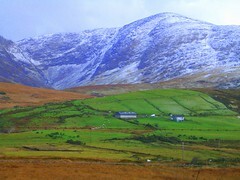 . .
My laptop is set up so the screensaver shows many different beautiful pictures of Ireland. Both my grandmothers were Irish and I have long desired to visit there. In fact, my son, during his recent deployment, had a three hour layover in Ireland in route to his destination. "Ireland looks like one big golf course," was what he told my husband. Our son was the first of myself and our children, of Irish heritage, to reach that green isle, but unfortunately he was unable to leave the airport during his time there. One thing I love to do with his two children is to have them sit beside me and look those pictures of Ireland on my computer. They find the verdant hillside with its rocks and sheep just as beautiful as I do. They love the pictures of the beaches and waterfalls and even the cities will draw an "Ooh" and "Ahh" from them. I particularly love the pictures of the old abbeys, most which are now in ruin. There is one in particular which almost brings tears to my eyes when I view the pictures. Something about it seems to pulls on my heart strings. One day I hope to set foot on that "Emerald Isle," and to view the beauties with my own eyes. Yet, as beautiful as I believe the land of my ancestors to be, I know that the most beautiful things I will ever see I have yet to see. This will be true even after I have been to Ireland. For once I have passed from this life to the next there are beauties awaiting me which I cannot even begin to imagine. There are sights so wondrous that the most glorious sight in Ireland will seem as a slum in comparison. The most glorious of these, of course, will be the face of the Lord Jesus. The moment we first see His face, every other sight we have thought of as beautiful will recede into the background. The words of the song we love to sing are correct, "Jesus will outshine them all." So as we face each day with its challenges and temptations, let us have hope. Let us have joy and let us have peace. Our best days, our most beautiful sights, our most glorious experiences await us. As long as I can remember, I have loved stormy days. I love seeing the sky fill up with rolling masses of bubbling clouds. I love it when the clouds have all colors of blue and grey and white combined. I love to see and hear and smell the rain as it falls. I love the soft misty rain, the gentle rainfall and especially the hard pelting rain. I love the swirling wind that comes with the stormy weather. (I don’t like the howling wind of hurricanes, but that’s another story for another day.) I love feeling the wind push me along, throwing my hair in all directions and making my dress flit and fly. I love listening to the sound of thunder, especially when it is in the distance. I love the deep resonance of the sound, its vastness and greatness. Even the crack of lightning is exciting – if it isn’t too close! Last night as I was listening to the rain fall outside and the thunder roll in the distance, I began to ponder why I enjoy stormy weather. We were just settling into bed, and the answer came to me. I love stormy weather because it so emphasizes being safe inside. If I were standing out in the stormy weather with no hope of a safe haven, I would dread the gray clouds and rolls of thunder. Even if we were out on the river kayaking, the sight of a dark cloud or the peal of thunder would be enough to send us paddling fervently for our put in. The thing that makes the storm enjoyable is the safety of the home. Is that not like our Lord? We no longer have to fear the storms that may assail us when we can rest safe in the Rock that calms the storms with His very words. There are no winds which can reach into the cleft of the Rock where our Lord has hidden us. Indeed, He has hidden us within His very self. It is true the winds may pull at our outer shell, we may feel the wind on our human frame, our emotions may feel the tug of the storm. But our spirits, if we have come to know the Lord Jesus, are joined to His spirit. Because of that we can know the peace and safety, the calm and rest the Lord Jesus knew in the bottom of the boat when His disciples thought they were perishing in the winds. Whatever storm blows at your house today – as Paul said, "without were fightings, within were fears" —whatever the storm, you can know peace and rest and safety because Christ is your Peace. He is your Rest and safety is of the Him. There is nothing that has happened, is happening or will happen in your life that has taken or will take Him by surprise or that is bigger than His ability to work it for good in your life. He is that Rock to which we can cling, in which we are eternally hidden. So when the storms of our lives come, let us not look at the wind, at the rain and the lightning, let us look to “Jesus the Author and Finisher of our faith,” the One who calmed the storms of the seas and who is our calm and peace in the midst of any storm we can face in our lives.